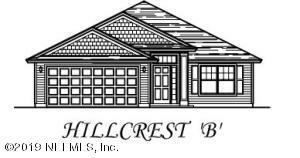 The Hillcrest offers 3 bedrooms, 2 baths and spacious Gathering room. Kitchen includes a large island, stainless steel appliance, ceramic tile floors and 42'' cabinets. This home has been on the market since Jan 29,2019. Courtesy of MONOGRAM REALTY INC.